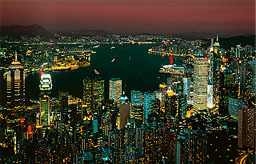 Hong Kong Habour You will relish the city nights as you cruise along the famous Hong Kong Harbour in a Chinese Junk. This evening will be full of lasting memories while you delight in a 10 course Chinese Dinner at the Lei Yue Seafood Village. * Rates are land only. Rates are per person, double occupancy and are subject to change, availability, holiday/seasonal supplements, blackout dates and any restrictions that apply. Valid for travel through Sep 12, 2004 & Nov 16 - Dec 31, 2004.